Bit of a busy week. Sudden realisation. 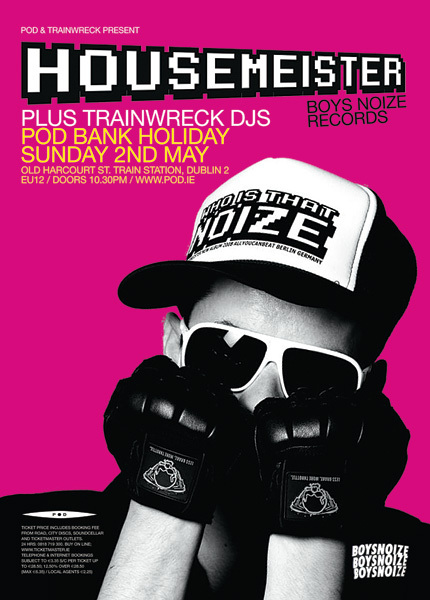 That Housemeister poster needs to be done! 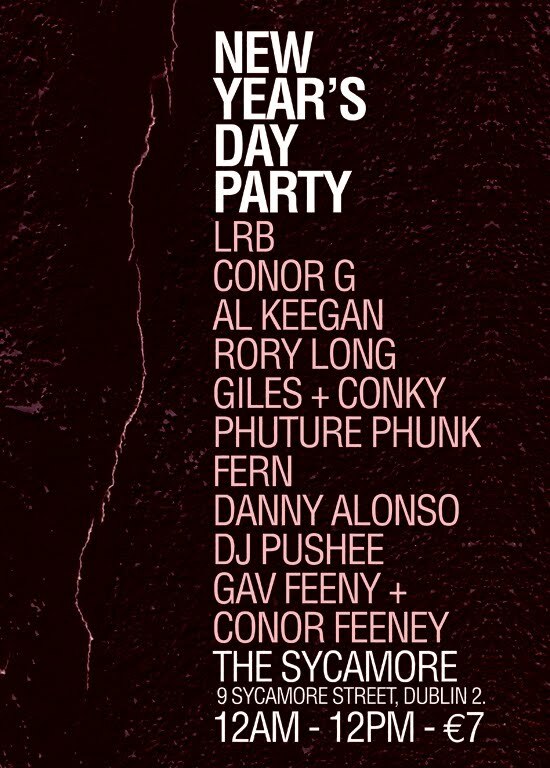 So I knocked this up and sent it over. Turns out it wasn't needed at all. Oh well no harm. 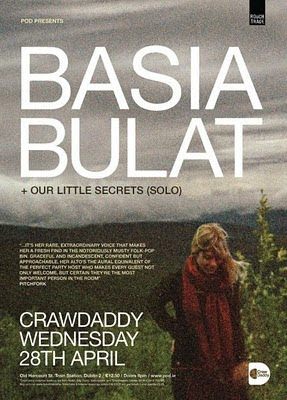 Basia Bulat, from Canada, makes her second visit to Dublin this week. 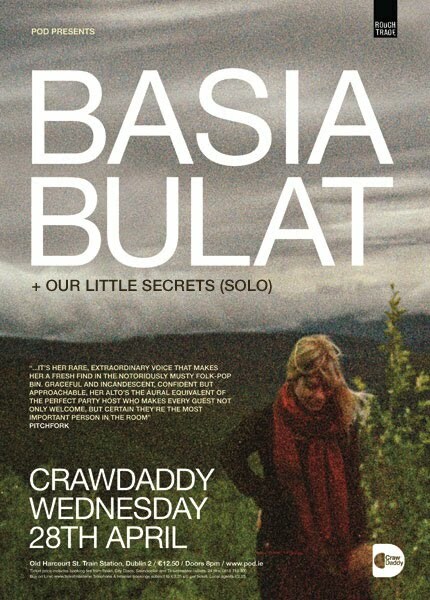 Here's the poster, based on the lovely grainy photo on her latest album. 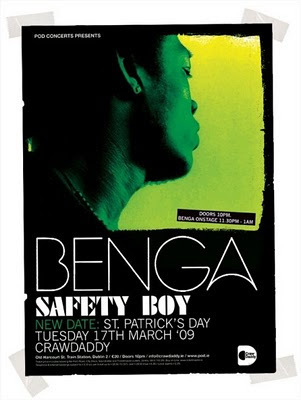 Poster for Benga from 2009. 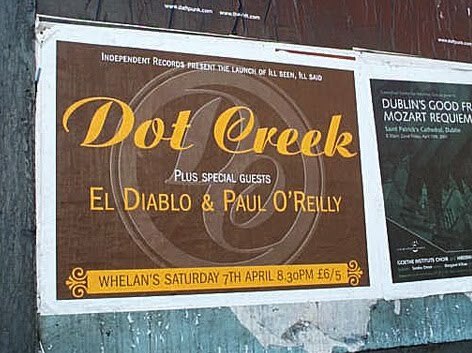 At the time posters were getting used more and more in emails and on social networking sites so I tried out this idea of adding in some fake sellotape and distressing the "paper" a bit like in the old days of the poster wall at the Well Fed Cafe in Dublin. I liked the results but stopped doing it after a while as I just didn't have the time. Another current one. Everyone was going mad about Gil Scott-Heron's latest album, I thought it had a cool cover. The one on the left is the poster but when I was uploading it here I thought I'd try out another layout, one more like the album cover. I believe this is the first Hansard related poster I've done, hmm must think about that, I think the Frames have been in there somewhere. 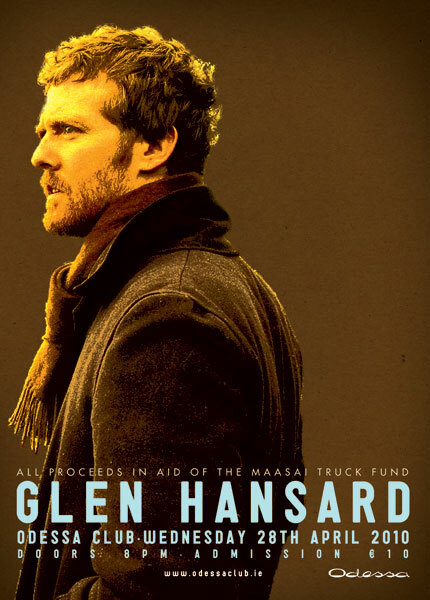 Anyway, he's doing a charity gig in the Odessa Club this month and here's the poster for it. Turned out pretty well. 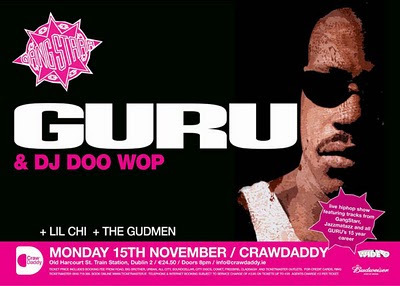 A while ago I posted a Gangstarr poster and mentioned that Guru had just had a heart attack. Well, he lost his cancer battle last night and died. I wish I had a better poster to use today because this design is crap, but still... this marks his visit to CrawDaddy in November of 2004. I have another one from '02 or '01 in the locker somewhere too. A poster for The Slits. Put together in record time. I had a poster all ready to go and sitting the locker waiting to be printed. But when the time came to send it I realised it was a load of rubbish, so with an immediate deadline I used this book cover as inspiration and knocked this together. This uses Impact, yea. Here's a quick thing that was done for a yoke in a place. 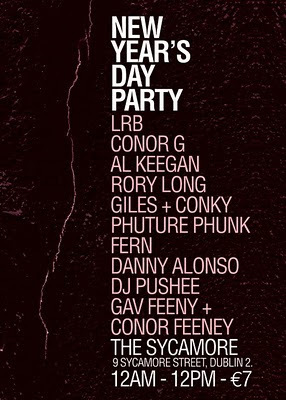 This was news year's day 2010. It's fairly no-frills but poetic. I read this morning that the drummer Steve Reid has died. 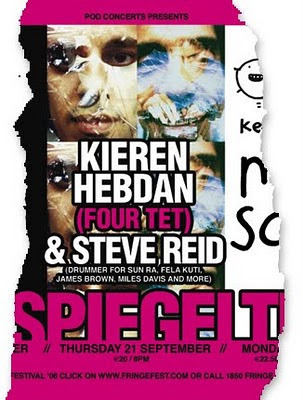 I posted a nice Steve Reid poster a few weeks ago but I know I have at least two more in the archives. I spent a little while this morning trying to find them to no avail. Best I could find it this section of a larger poster from 2006 I think. This show was in the Spiegeltent as part of the Fringe Festival. 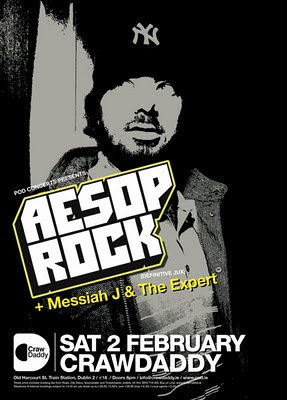 Aesop Rock from 2008. Must have been a busy day, I have no recollection of doing this. Really old one this, price still in £!. 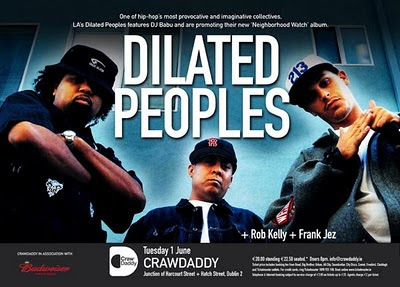 Anyway, this is from 2001. Dot Creek were a really good band, most of the time. No, really. When they were ON they were fantastic, the planets didn't always align though. This poster is a two colour job for their album launch just over 9 years ago. 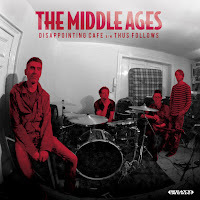 All of the design elements come from their album cover, by the excellent Niall McCormack, I just put this one together. Dilated Peoples poster from way back, 2004 I think. A bit heavy on the ol' photoshop here. Still, they liked it and took some posters away with them. Nice. 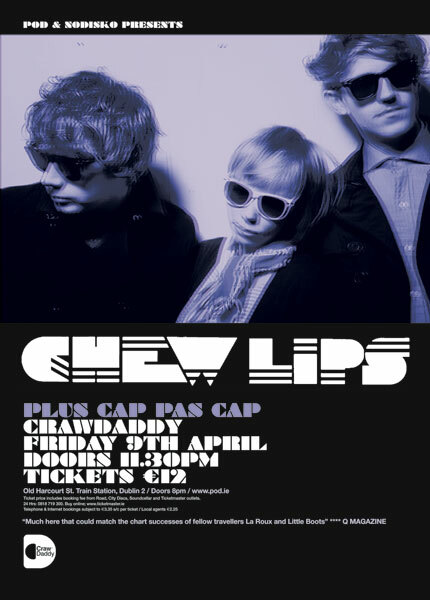 Here you go, poster for hip band Chew Lips. Oh this is actually this Friday, check out openers Cap Pas Cap. One from 2009. 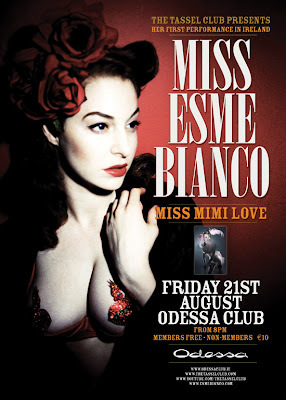 This is for a Miss Esme Bianco show at Odessa in Dublin. 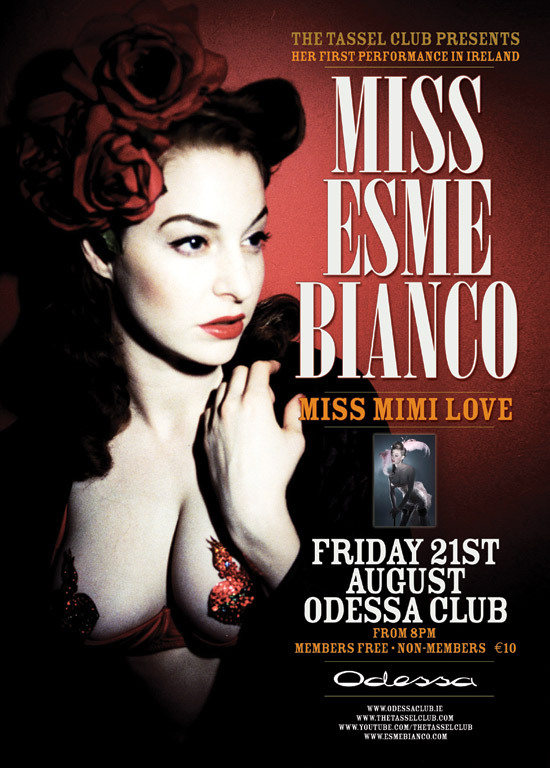 Esme is a model, singer, actor and cabaret star of quality.